Tropical Storm Erika, coming as it did so close to the beginning of the new college and professional football seasons, is a reminder that Monday-morning quarterbacking is nearly as popular an activity as the sport itself. And we at NHC do it too. After every storm we review our operations with an eye toward improving our products and services. Erika is no different, though there’s been more questioning and criticism than usual, with few components of the weather enterprise spared. Some in the media were accused of overinflating the threat, numerical models were bashed, and some public officials were charged with overreacting. 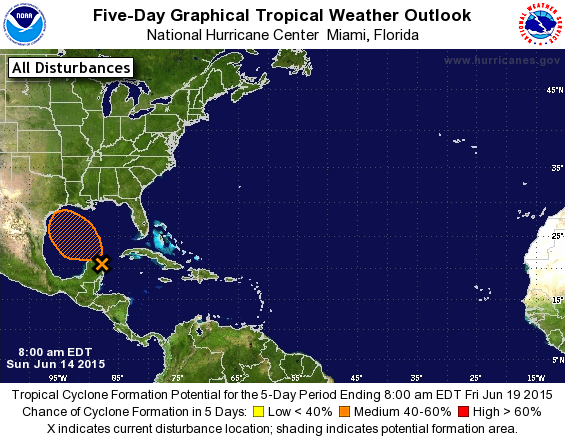 NHC’s forecasts were questioned while others lamented that NHC’s voice wasn’t strong enough amid all the chatter. 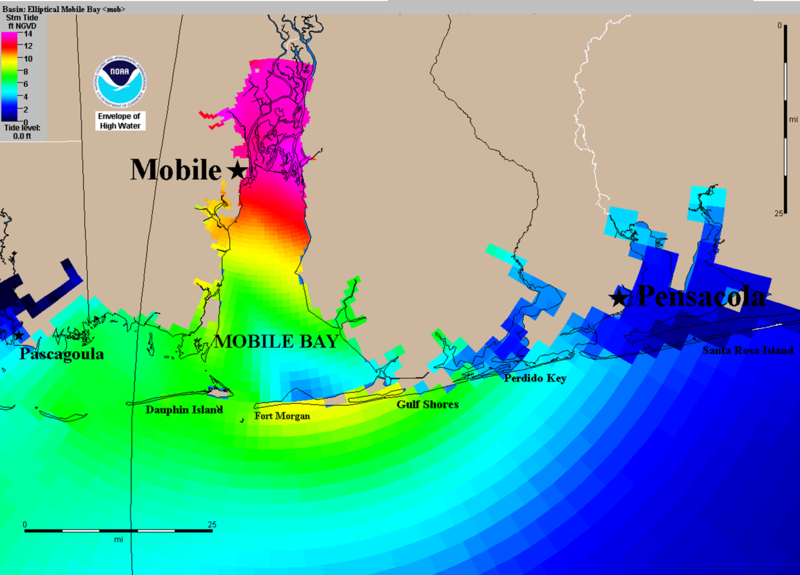 So, in the spirit of searching for a tropical storm eureka, in this blog entry we present some of our own post-storm reflections. How good were NHC’s forecasts for Erika? 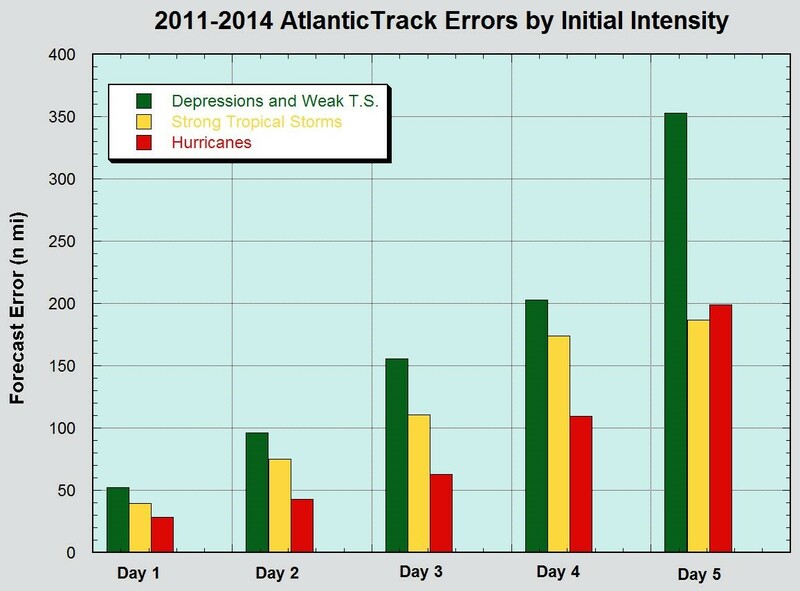 The NHC official forecast errors were larger than average. 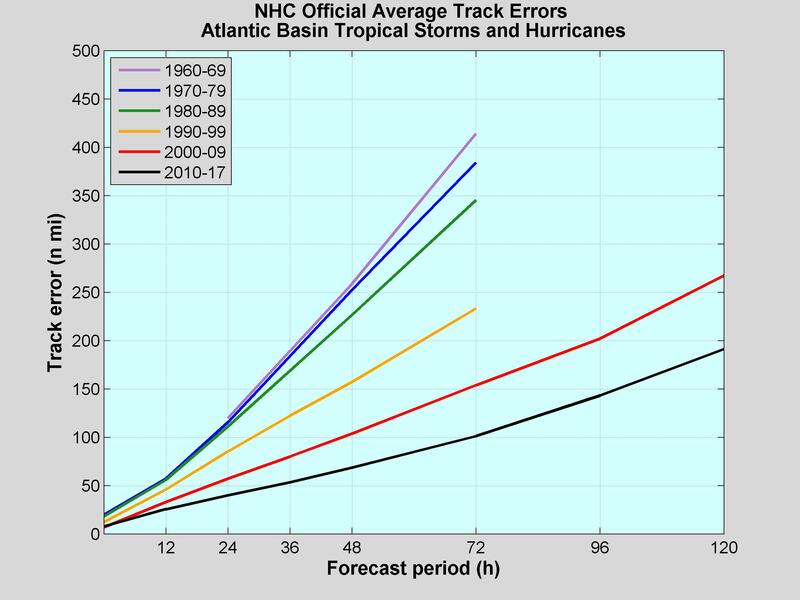 A preliminary verification shows that the average 72-hr track error for Erika was 153 n mi, about 30% larger than the 5-year average of 113 n mi. And nearly all of this error was a rightward (northward) bias – that is, Erika moved consistently to the left of the NHC forecast track. As for intensity, Erika ended up being weaker than forecast; the 72-hr intensity forecasts were off by about 20 kt on average, and the official 5-day forecasts called for a hurricane over or near Florida until as late as 2 AM Friday, when it became clear that Erika was going to have to deal with the high terrain of Hispaniola. Why was Erika so difficult to get right? 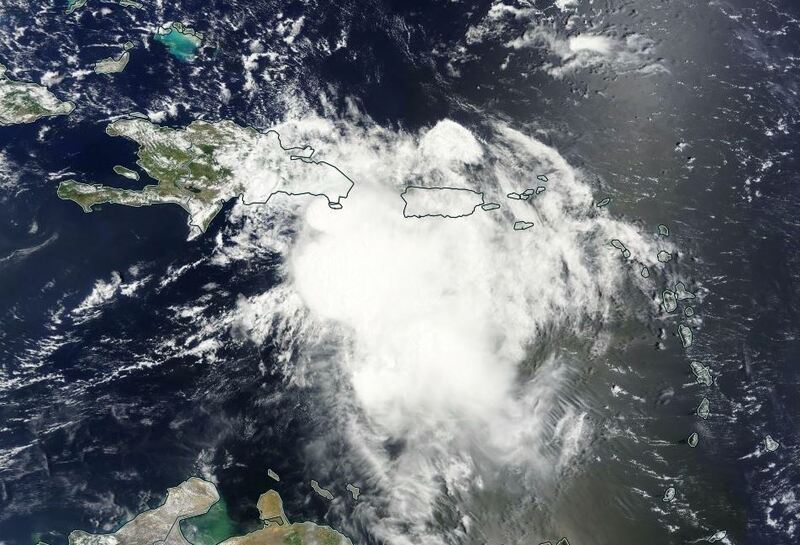 Erika was a weak and disorganized tropical cyclone, and weak systems generally present us (and the computer simulations we consider) with tougher forecast challenges. 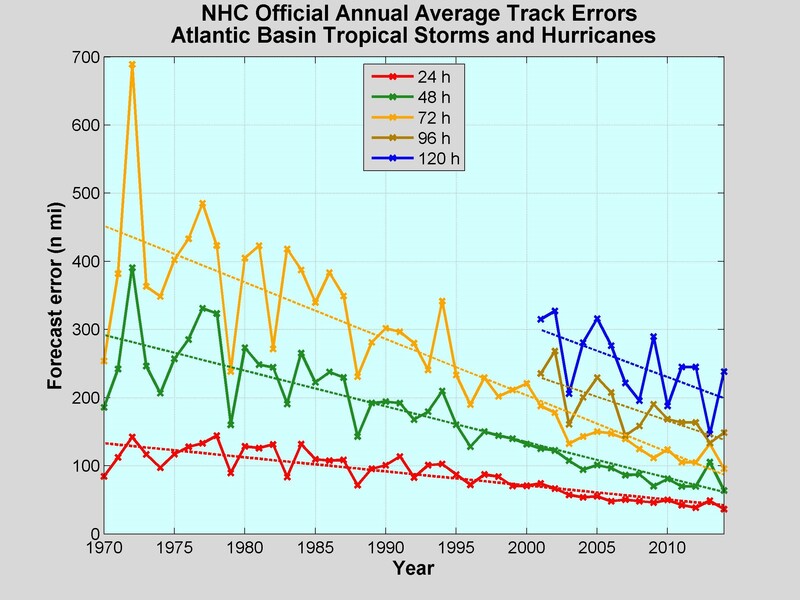 In fact, the average 72-hr track error for all tropical depressions and weak tropical storms is around 155 n mi – just about exactly what the errors for Erika were. So the track issues weren’t really a surprise to us. Of course, knowing whether such errors were going to occur and how to reduce them in real time wasn’t obvious. If it had been obvious, we would have called an audible and changed the forecast. What made this particular situation so challenging was wind shear, mainly due to strong upper-level westerly winds in Erika’s environment. These winds tended to displace the storm’s thunderstorms away from its low-level circulation, causing the storm to lack a coherent vertical structure. When this happens, it’s very difficult to tell just how much influence those upper-level winds will have on the storm track. Sometimes storms hold together against wind shear (Andrew of 1992 is a good example), and there were times when Erika seemed to be winning its battle. If it had held together better, it would have taken a track more to the north and ended up being a much stronger system. Obviously, it didn’t play out that way, but that was an outcome far easier to see with the benefit of hindsight. An additional complication was Puerto Rico and Hispaniola. 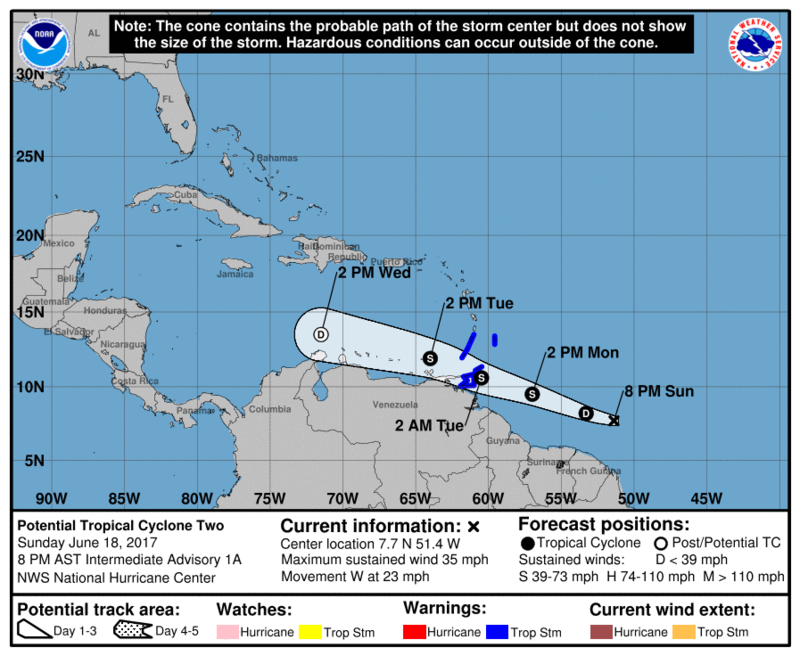 If Erika had been able to avoid those land masses, it would have been better able to withstand the disruptive effects of wind shear. And early on, we expected Erika to mostly avoid land. In this case, not getting the track right made it much harder to get the intensity right, which made the track forecasts harder yet. 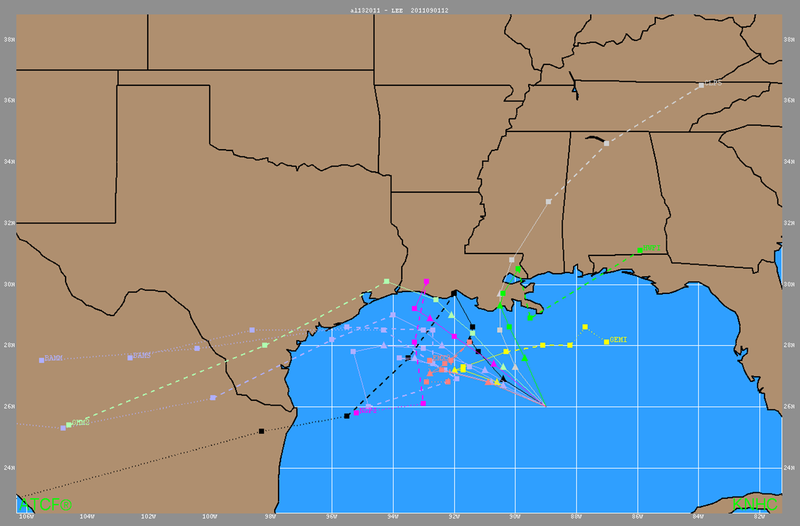 Is there too much reliance on numerical models, and did they fail for Erika? 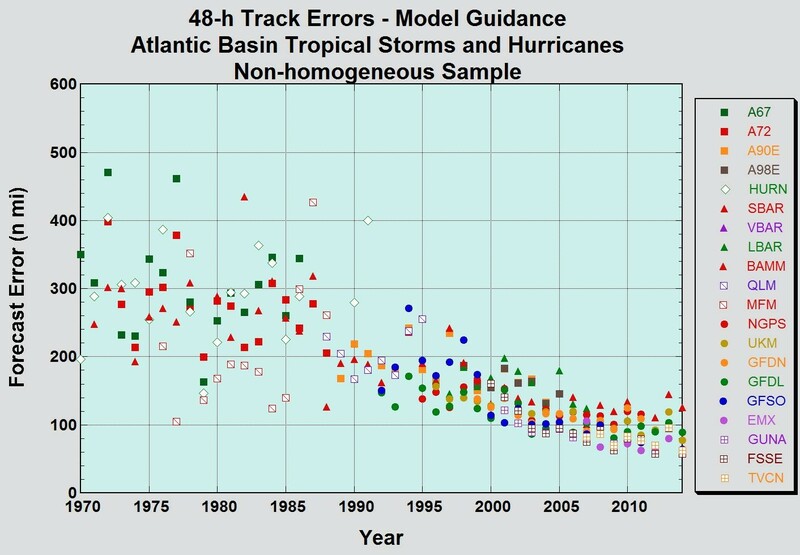 The improvements in track forecasting over the past few decades are directly attributable to improvements in numerical models, and to the data used to initialize them, to the point where it’s become almost impossible for a human forecaster to consistently outperform the guidance. The modelling community deserves our praise for the tremendous progress they’ve made, not criticism for missing this one. While we approach each forecast with an attempt to diagnose when and how the models might fail, it is exceedingly difficult, and it’s not something we do in our public forecasts unless our confidence is very high. 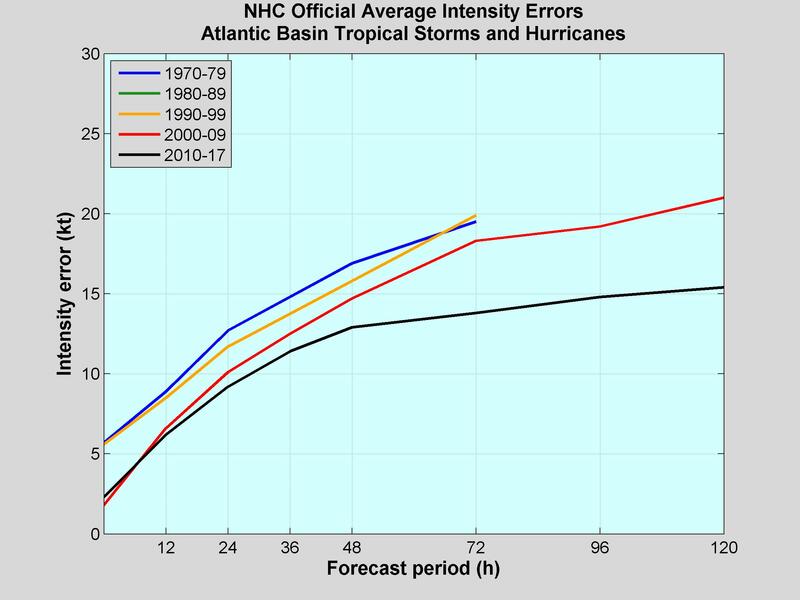 Human forecasters (including those at NHC) are still able to occasionally outperform the intensity models, mainly because satellite depictions of storm structure can often be used by forecasters more effectively than by models, giving us an edge in certain circumstances. 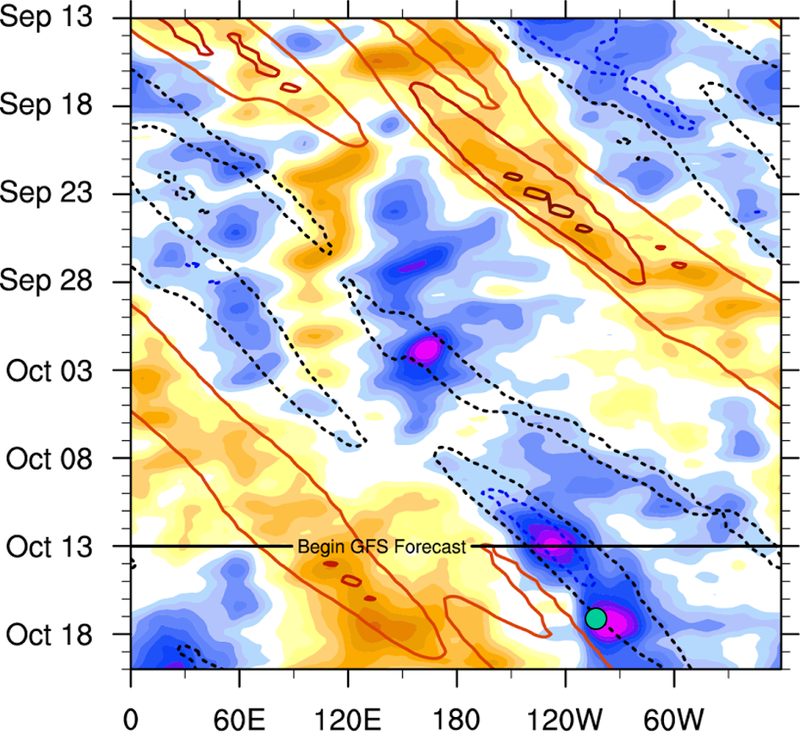 But neither human forecasters nor the models are particularly good at anticipating when thunderstorms in the cyclone core are going to develop and how they’re going to subsequently evolve, especially for weaker cyclones like Erika. 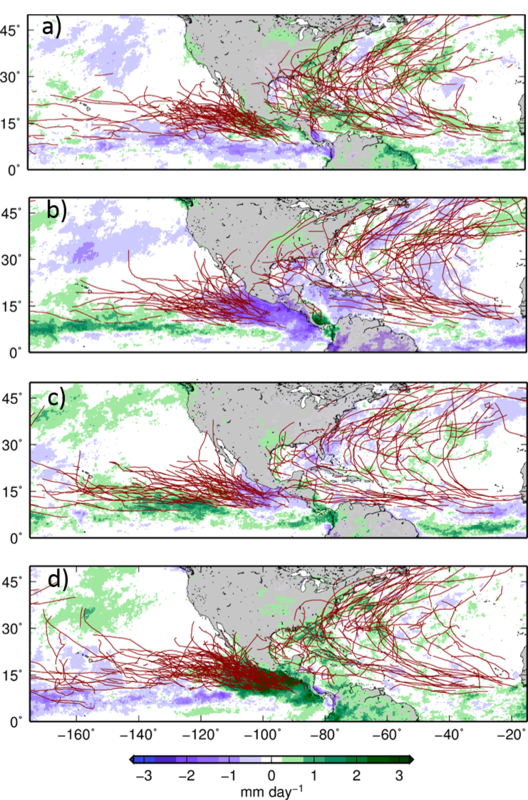 Because the atmosphere is a “chaotic” physical system, small differences in an initial state can lead to very large differences in how that state will evolve with time. This is why the model guidance for Erika was frustratingly inconsistent – sometimes showing a strong hurricane near Florida, while at other times showing a dissipating system in the northeastern Caribbean. It’s going to take a large improvement in our ability to observe in and around the tropical cyclone core (among other things), to better forecast cases like Erika for which storm structure is so important to the ultimate outcome. 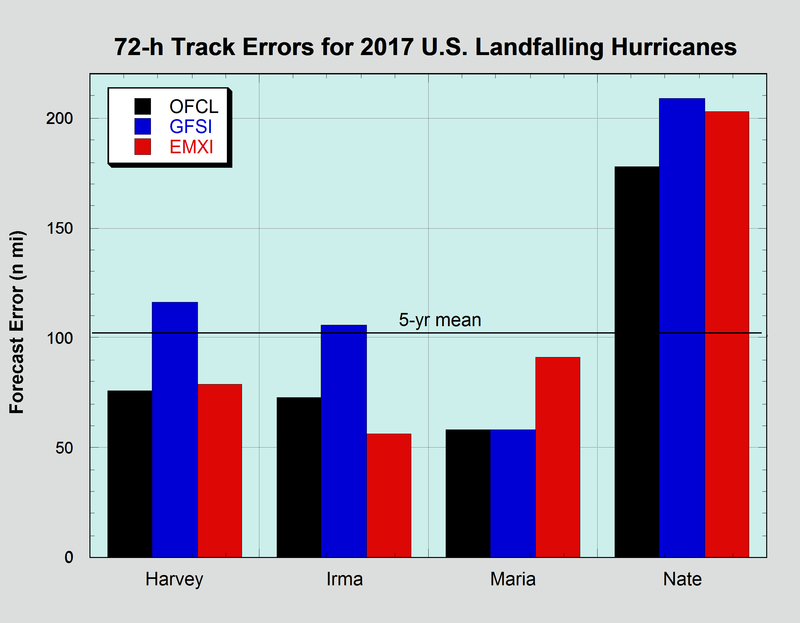 But our best hope for better forecasts lies in improved modeling–a major goal of the Hurricane Forecast Improvement Program (HFIP). Given the overall model guidance we received during Erika, it’s hard even now, well after the storm, to see making a substantially different forecast with current capabilities and limitations. 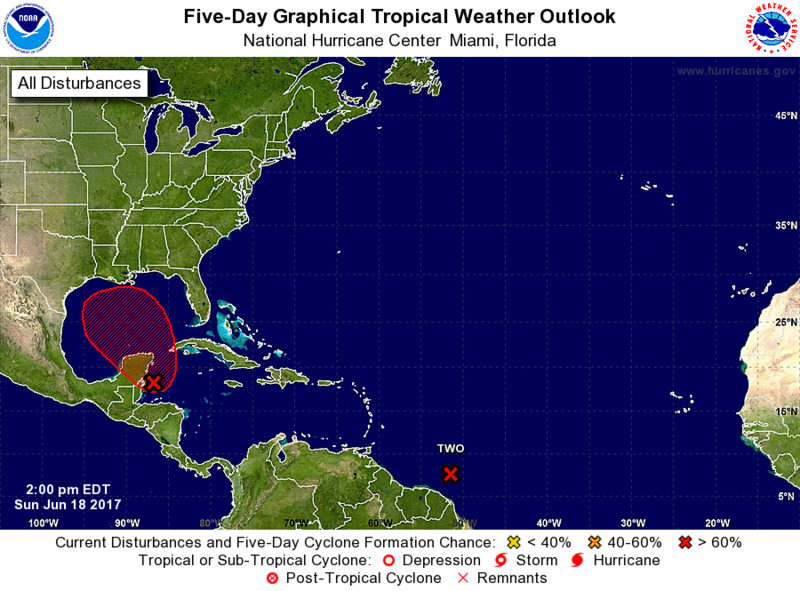 In fact, had our first few advisories called for a track much farther south at a much weaker intensity, or even a forecast of dissipation due to interaction with Hispaniola, our partners and the public might rightly have questioned our rationale to go firmly against many model forecasts of a stronger system farther north. 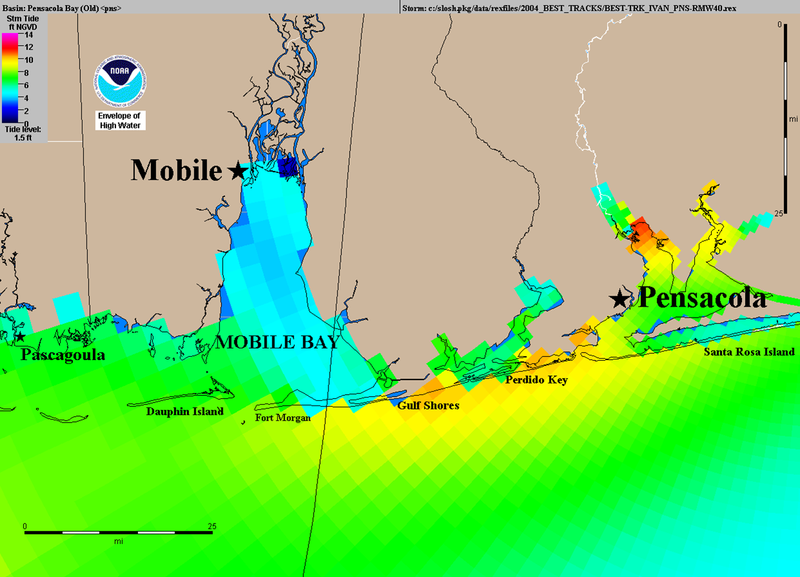 Was the message from NHC muddled? We think that there might be some ways for NHC to make key aspects of our message easier to find. 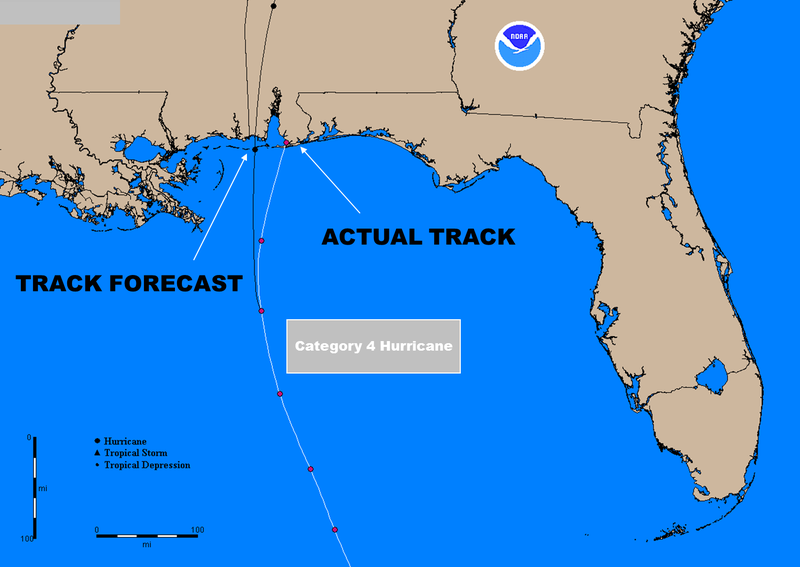 Although NHC’s Tropical Cyclone Discussions (TCDs) repeatedly talked about the uncertainty surrounding Erika’s future beyond the Caribbean, including the possibility that the cyclone could dissipate before reaching Florida, it does not appear that this was a prominent part of the media’s message to Florida residents. Making key “talking points” more distinctly visible in the TCD and the Public Advisory are options we are considering, as well as enhanced use of NHC’s Twitter and Facebook accounts. Having said that, consumers and especially re-packagers of tropical cyclone forecast information, like our media partners, should take some responsibility for making use of the information that is already available. We also invite our media partners to take more advantage of the numerous training sessions we offer, mostly during the hurricane offseason. Reaching anyone in the television industry with such training, except for on-camera meteorologists, has proven over the years to be very difficult. 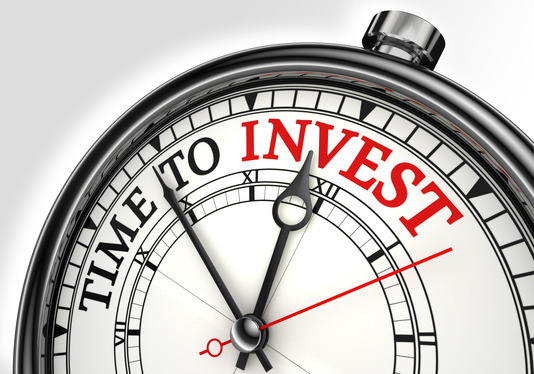 We would like to train more reporters, producers, news department staff, executives, etc. so they are more sensitized to forecast uncertainty and how to communicate it with the help of our products, but we realize that a more focused “talking points” approach as described above will probably be needed to assist these busy folks in conveying a consistent message. 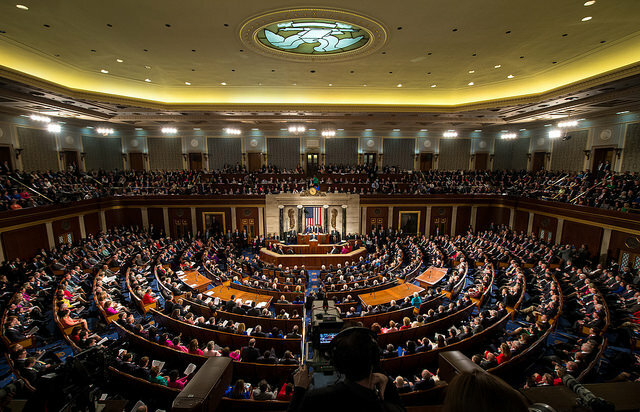 An NHC advisory package contains a variety of products, each geared to providing a certain kind of information or to serving a particular set of users. 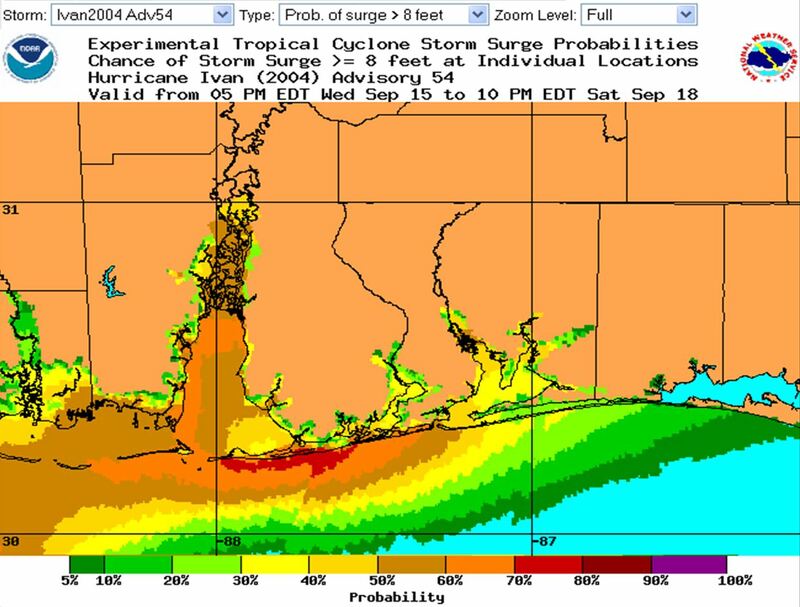 Some of our media partners have expressed concerns over the increasing number of NHC products, but the various wind and water hazards posed by a tropical cyclone cannot be boiled down to one graphic, one scale, or one index. 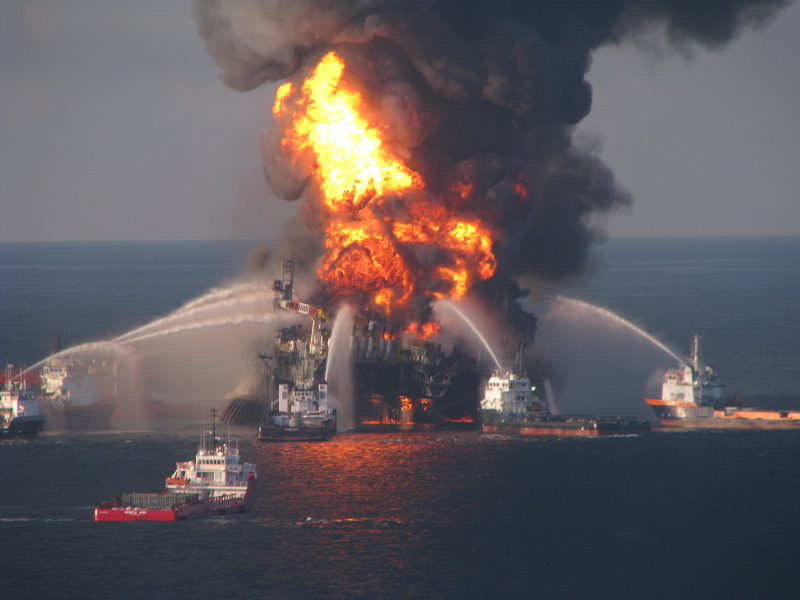 We are, in fact, still in the process of intentionally expanding our product and warning suite to focus more on the individual hazards and promote a more consistent message about those hazards. Even so, two of our products that have been around for many years are still crying out for greater visibility. We’ve already mentioned the Tropical Cyclone Discussion, a two- to four-paragraph text product that is the window into the forecaster’s thinking and provides the rationale behind the NHC official forecast. In the TCD we talk about the meteorology of the situation, indicate our level of confidence in the forecast, and when appropriate, discuss alternative scenarios to the one represented by the official forecast. Anyone whose job it is to communicate the forecast needs to make the TCD mandatory reading on every forecast cycle. 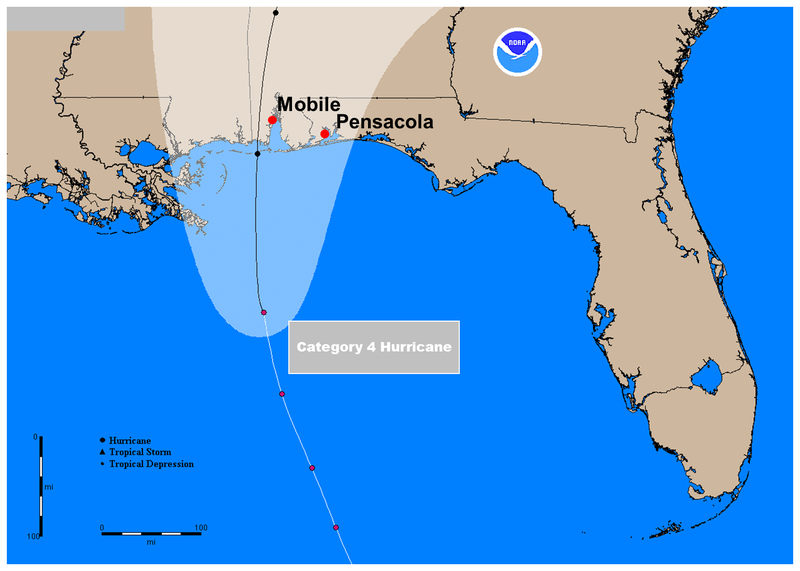 Some users may not understand the amount of uncertainty that is inherent in hurricane forecasts (although we suspect Florida residents now have a greater appreciation of it than they had two weeks ago). We need to continue to emphasize, and ask our media partners to emphasize, NHC’s Wind Speed Probability Product, available in both text and graphical form, which describes the chances of hurricane- and tropical-storm-force winds occurring at individual locations over the five-day forecast period. 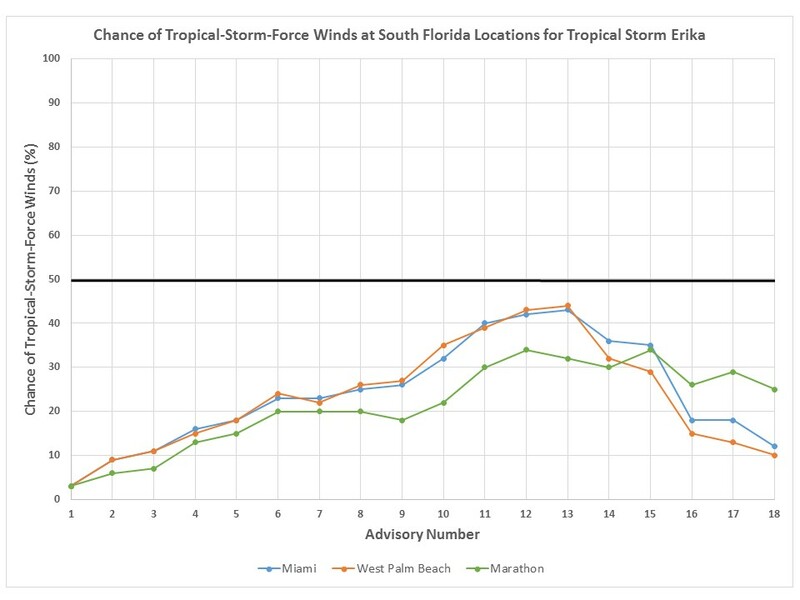 Someone looking at that product would have seen that at no point during Erika’s lifetime did the chance of hurricane-force winds reach even 5% at any individual location in the state of Florida, and that the chances of tropical-storm-force winds remained 50-50 or less. In addition, in some of the number crunching we did after the storm, we calculated that the chance of hurricane-force winds occurring anywhere along the coast of Florida never got above 21%. We realize that at first it seems counterintuitive that we are forecasting a hurricane near Florida while no one in that state has even a 5% chance of experiencing hurricane-force winds. That, however, is the reality of uncertainties in 5-day forecasts, especially for weaker systems like Erika, and the wind speed probabilities reliably convey the wind risk in each community. We did notice a couple of on-air meteorologists referencing the Wind Speed Probabilities, which is great – and the more exposure this product gets, the better. We would like to work with our television partners to help them take advantage of existing ways for many of them to easily bring the wind speed probabilities into their in-house graphics display systems. A very nice training module exists for folks interested in learning about how to use the Wind Speed Probabilities: https://www.meted.ucar.edu/training_module.php?id=1190#.VenooLQ2KfQ. You will need to register for a free COMET/MetEd account in order to access the training module. 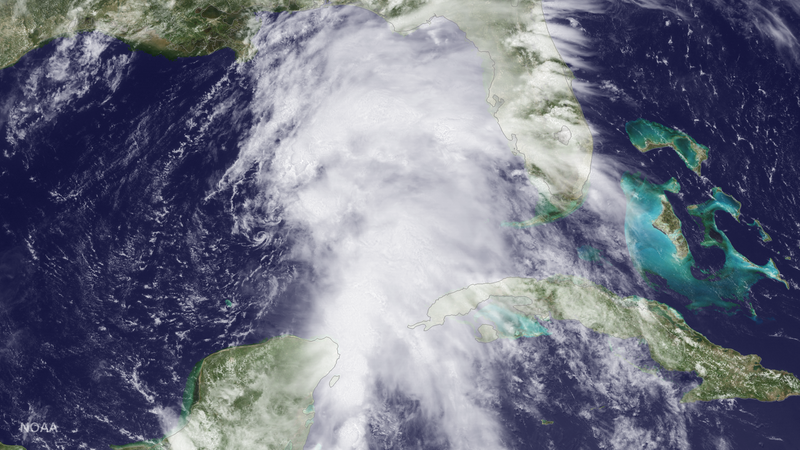 Did Floridians over-prepare for Erika? Anyone who went shopping for water and other supplies once they were in the five-day cone did exactly the right thing (of course, it’s much better to do that at the beginning of hurricane season!). 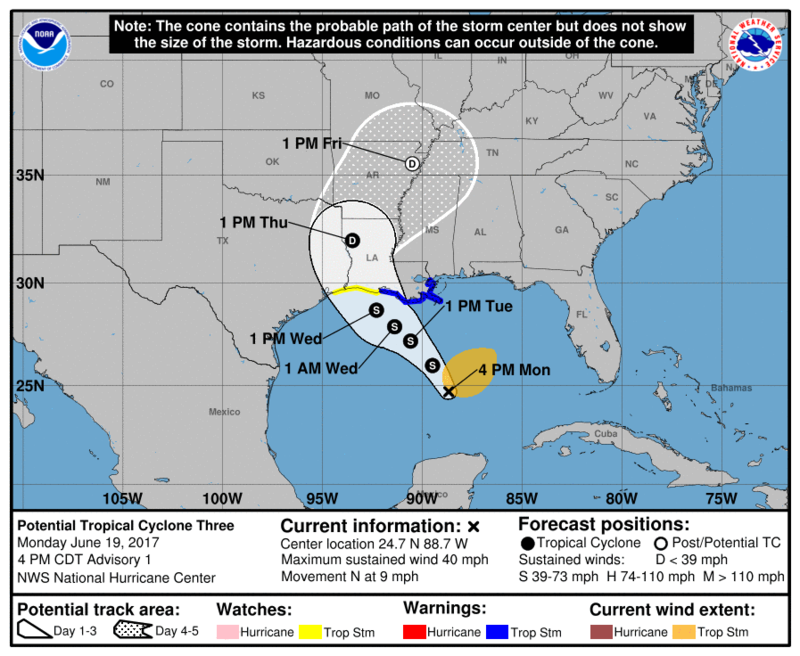 Being in or near the five-day cone is a useful wake-up call for folks to be prepared in case watches or warnings are needed later. But as it turned out, no watches or warnings were ever issued for Florida. 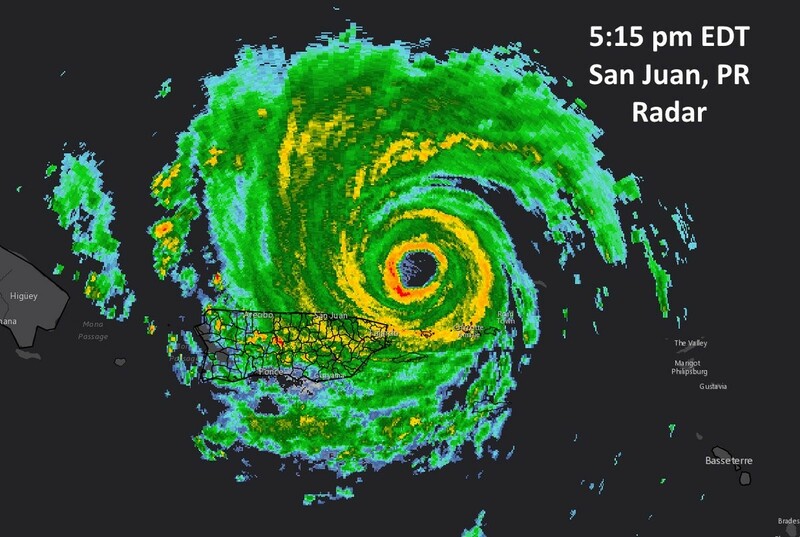 In fact, at the time when watches would normally have gone up for South Florida, NHC decided to wait, knowing that there was a significant chance they would never be needed – and that turned out to be the right call. What can NHC do better next time? While we’d like to make a perfect forecast every time, we know that’s not possible. Failing that, we’re thinking about ways we can improve the visibility of our key messages, particularly those that will help users better understand forecast uncertainty. As noted above, we’re considering adding a clearly labeled list of key messages or talking points to either the TCD or the Tropical Cyclone Public Advisory, or both. We’d also like to try to make increased use of our Twitter accounts (@NHC_Atlantic, @NWSNHC, and @NHCDirector), which so far have been mostly limited to automated tweets or to more administrative or procedural topics. We’re also looking at whether the size of the cone should change as our confidence in a forecast changes (right now the cone size is only adjusted once at the beginning of each season), and thinking about ways to convey intensity uncertainty on the cone graphic. But most of all, we need to keep working to educate the media and the public about the nature of hurricane forecasts generally, and how to get the information they need to make smart decisions when storms threaten. 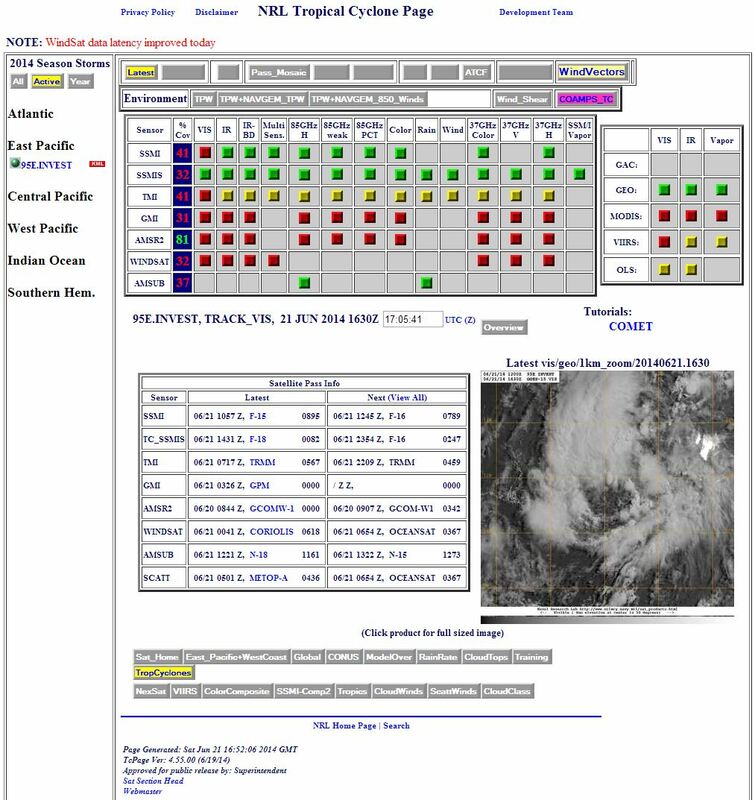 This entry was posted in Forecasting, NHC and tagged cone, Erika, Florida, forecast uncertainty, Hispaniola, hurricane, NHC, Puerto Rico, tropical storm.